These are supportive appliances worn on the outside of the body. They can help support the body in alignment, prevent muscles from shortening, make up for a shorter leg, or protect the body. Examples include: a spinal jacket to help someone with weak muscles sit up and breathe properly, a built up shoe with calliper for someone with a shortened leg due to polio, or specialist boots to support the weak ankles of a child with Down Syndrome. Orthotics help reduce pain, promote mobility, and can prevent surgery or amputation. We are a group of service users and health professionals who believe that NHS Orthotics provision in England needs radical reform. By uniting in one voice we can use our experiences of NHS Orthotics services to convince those in a position of influence to make the changes needed. Children and adults with disabilities or medical conditions need to get quality, well fitting splints and footwear quickly if they are to be able to carry on living their lives to the full. When they can't obtain them they may be in pain, unable to walk or stand or unable to carry on with work or school life. 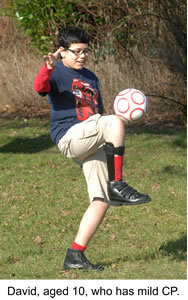 Many patients are waiting for months to obtain correct orthotic devices. Where these patients are children this means that devices can be outgrown almost as soon as they arrive. We believe that slow Orthotics provision not only compromises the well-being of patients but also wastes the tax payer money. This active child with mild Cerebral Palsy had to wait 17 week for his plastic leg support - during which time he had to use a wheelchair and was unable to attend school because his classroom was upstairs. We believe in the power of the 'patient story' - that is people who share their individual experiences of NHS Orthotics services and let us share them with the people who make decisions about the NHS to ensure patients receive the high quality treatment they need and deserve. Whether you are a professional or a service user we welcome you. Email us to be put on our mailing list so we can keep you up to date with our campaign progress. Better still, why not share your views about NHS Orthotics services with us? We will always ask your permission before sharing any information.